I thought it could make a cool abstract snowflake, so I got out my The Craft's Meow Typically Teen set and used the paint swoosh. 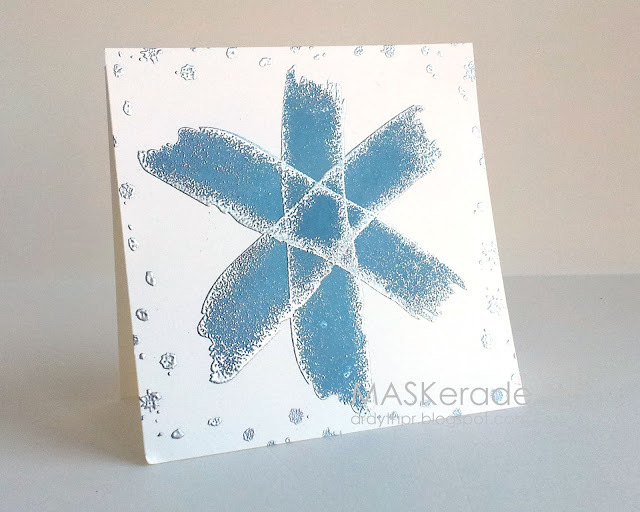 I rock and rolled the stamp in versamark before inking it up with Marina Mist and stamping it onto Whisper White. I wanted the silver just on the edges of the snowflake. What a surprise when this funky Star of David appeared! Perfect card for my daughter's Jewish teacher along with his "Christmas" present of Tickleberry's (chocolate covered blueberries from British Columbia). This is my first-ever Jewish card (even though it was unintentional). My daughter's school has quite a few Jewish teachers and from time to time, they ask if I make Jewish cards. I haven't in the past (despite owning Mazel Tov, the Papertrey set), because I don't know much about Jewish traditions and holidays and I would hate to get the colours or symbolism wrong (even now, I'm wondering if it's offensive to offset a Star of David like this - any advice greatly appreciated!). Maybe this will be the year I sit down with one of the teachers and discuss some designs. This is such a cool card. I immediately noticed the Jewish star, and wondered if you did that on purpose--until I read your text. My opinion is that it is beautiful, and not offensive at all. There are no colors that are off limits on Jewish cards, although many people use blue and white because those are the colors of the Israeli flag. If you have PTI Mazel Tov, then that is all you need to know to make a Jewish card--no patterns or colors are right or wrong. Maybe, don't use a cross (haha), but anything from Mazel Tov would work. Oh this is gorgeous. It is not in the least bit offensive. My sister-in-law is Jewish and I make her cards and she has never been offended by a mix of colors, etc. I'm sure your daughter's teacher will thoroughly appreciate this card! Don't you just love happy accidents? This is another stunner and I'm sure your daughter's teacher will love it! Yet another Ardyth original masterpiece, I love the rock 'n' roll effect and that star is such a creative bonus. Ardyth this rocks, I think it is so cool. I love that you accidently created the tar of David. I love this card - it is so striking! I'm sure the teacher will love it. I've really enjoyed seeing all your wonderful, bold and unique cards this year and have been inspired by you on many occasions. Wishing you and your loved ones a very Merry Christmas and a Crafty New Year. Ps:- I know what you mean about a frazzled brain. I lose my mojo about this time every year - I think it's the over stimulation and too many ideas for me! I think this is the most innovative way to create a star of David; whether it's intentional or accidental. I can't imagine anyone being offended by such a unique, fabulous creation! Your card is amazing!! I saw the Star of David immediately but also noticed it was not even. Your post reminded me of my predicament earlier this month. My husband had requested that I make a Hanukkah card for him to send to a business associate that he only knows via phone and e-mail converstaions. Well, I had never made a Hanukkah card before and had no stamps to use. I did end up buying one sentiment stamp, and had an idea for the card. I wanted to use a Star of David template I found online as a mask and use some pretty blue Glimmer Mist... well my Star of David was not as perfect as I had thought and I just couldn't get the look I wanted, so I just wasn't happy with that try and ended up just using the sentiment stamp embossed in silver and some blue cardstock that I dry embossed mounted on some brushed silver paper. I was happy with the end result (and thank goodness, so was my husband), but it certainly wasn't what I had hoped for. I was so afraid that my card would be offensive so I went the safe route. I will really look forward to any future posts you do with more info on this subject. You're not fooling me for one minute, Ardyth, on some level you KNEW this was going to happen! What a crazy-cool graphic image ... like this would be a logo for a Jewish organization or foundation. Hmmm ... what else can you make from paint smears?! This one is amazing!